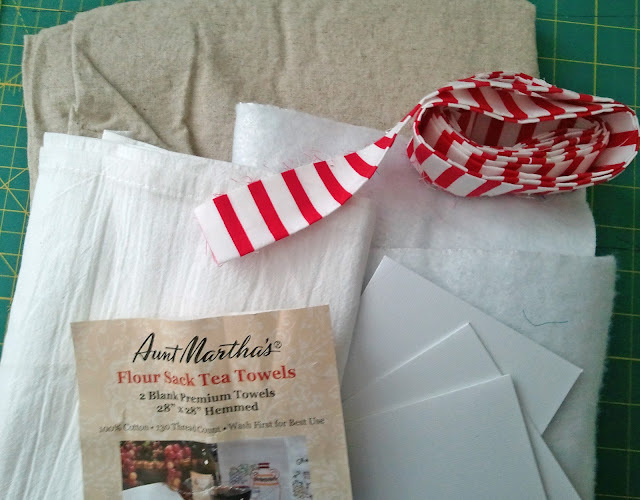 Sew Festive Handmade: Christmas in July: Schedule and PRIZES! July 30: YOU...link up your finished holiday projects for pats on the back from everyone and a chance at some great prizes! I hear some of you thinking "And just what are those prizes, hmmm...?" A Christmas scrap bag! This was put together by Sew Love Fabrics and contains about 2 yards of fabric. A panel from Kate Spain's Flurry [I think it's approximately 2/3 yd], 3 yards of insanely adorable itty bitty pom pom trim in white, and 1/2 yd Kona White [not pictured]. 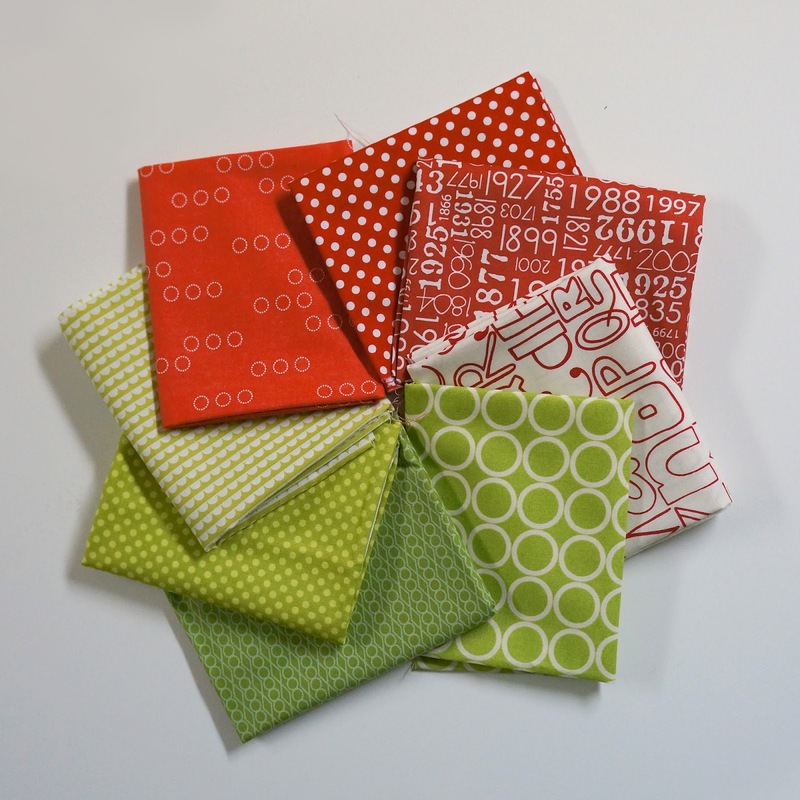 Another FQ bundle! This one was put together by me! 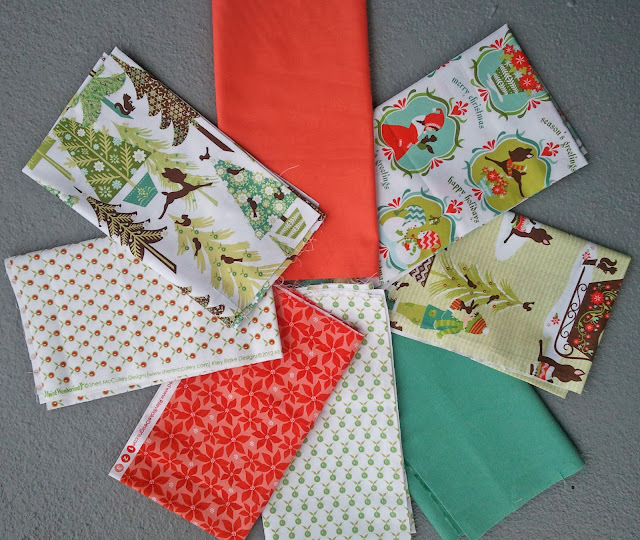 Six FQs of the new Riley Blake line Alpine Wonderland, and then 1/4 yd cuts of coordinating solids [Cotton Couture in Coral and Moda Bella in what is a Seafoam color, but I don't know the exact name]. This line is great because if you've seen it in person it's not "typical" Christmas colors, so the coral might seem a little out there, but trust me, it matches everything fantastically. And I want everyone to be getting really really excited about this event, so I have a giveaway for today! Today's winner will be getting a mini prize pack of some items that are supplies for some of the tutorials during Christmas in July! So one lucky person will be so prepared already when July rolls around. So you can get up to 4 entries! You have through Monday June 11th at midnight EST to enter and mention the event. Yay, looking forward to it!! I would love to make a Christmas quilt this year - let's see if I can squeeze it in! This is so awesome! I've been looking forward to Christmas in July ever since you mentioned it because I started a mosaic nativity Christmas quilt two years ago and it's still in my UFO pile. The main reason is just what you mentioned: Christmas comes around and ACK TOO MUCH TO DO. So I was already determined to work on it this summer and your celebration will be a great motivator. Thanks for the fun giveaway today too! Also, I follow you in my google reader, not sure if that counts! Very excited to see what everyone makes! I have some charm packs of Joy that I'd like to turn into either Christmas placemats or a lap quilt to put on the couch during holiday time. We'll see what I come up with! OK just added your button to my side bar and added to today's post a link also. Looking forward to this. This is my first year quilting for Christmas and just cant wait to see some good ideas of what to make. I blogged about the event! I want to make a tree skirt, 2 table runners, and a coaster set for Christmas. You know, I've never made Christmas items but this year I really want to make a solid effort. I can't wait! Thanks for the giveaway. I'd love to make some stockings for my 3 dogs and maybe a tree skirt if I get ambitious! I am a follower and was so excited that I forgot to mention what I wanted to make for Christmas! I hope to make a table runner or two, a bag and maybe a wall hanging. 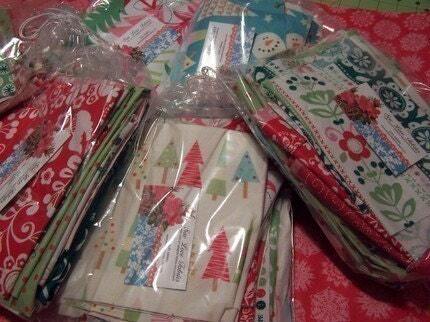 I have some fabric to make a Christmas quilt (Flurry & Joy charm packs). Hopefully make some hand-made Christmas gifts too, perhaps a quilt for my sister. My grandsons love having placemats on the table, so thiis year i plan to make them a set of fun ones! I'll be back to follow along in July! I plan to make some ornaments and some pincushions for gifts, but for me, I plan to make a top from some Christmas charm packs I've been saving. I just have to decide on a pattern! I'm going to make everyone in the family tablerunners this year. I gave a few to friends last year & my family saw them before I wrapped them & now they want one. Thanks for having a great giveaway. So far I plan two wallhangings (one as a gift) and some felt ornaments. I love to make tablerunners, so I'm hoping and planning on making some for Christmas. I am hoping to make a few stockings for family members. Pillowcases and runners are on my list so far! 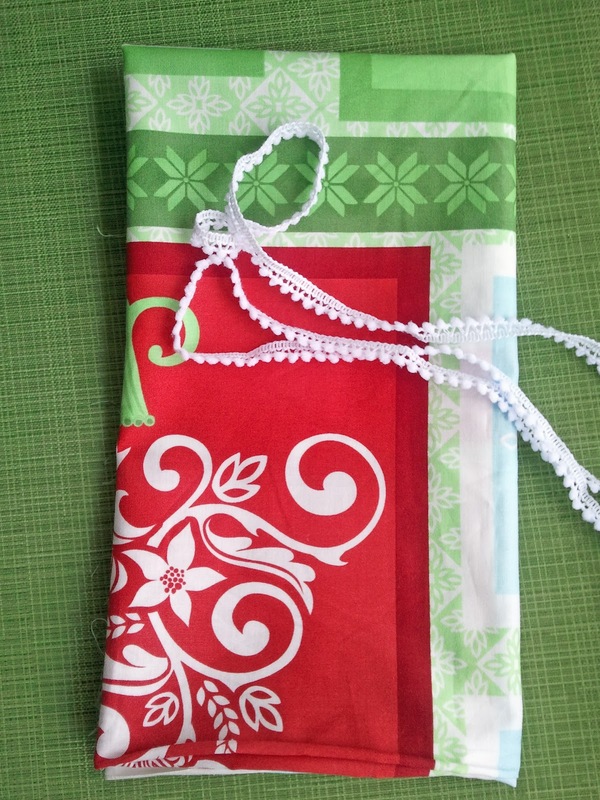 I'm planning to make holiday table runners for my children and their spouses and another for a charity auction. Looking forward to Christmas in July! I always make a quilt for our family gathering, a large group of extended family. All the adults bring a large nice gift and we get to try to get the one we want. Was thinking this year's quilt might be a Christmas quilt. I am making a Mystery quilt with a QAL and lots of ornaments. I added your button to my side bar. a vintage red and green wallhanging to hang all month long (december). I've added your button on my sidebar and have also blogged about it :) looking forward to Christmas in July! I'm planning on quilting a batik quilt I made earlier this year and I would also like to make a 'Grinch' quilt. I'd love to make some holiday pillows and a warm and cozy holiday quilt. Not really sure what I'll make for the holidays yet... maybe a quilt if I have time, or some pretty pillows. Ahh, Christmas gifts. I have not decided what I want to make. Mom is hinting around for another quilt and my sister has hinted about a purse. So I might try both of them or something totally different. I have at least a dozen tops and tree skirts ready to be quilted. It would be nice to get a few of them finished! I've added you to my Google Reader. Good job on the skirt! I plan on making ornaments for my co-workers again but hopefully this year i won't be rushing the week before we let out for break! I plan to make some tree ornaments and a table runner or two. Probably some gifts too, but those haven't been determined yet. Thanks for the give away! I blogged and added you button to my sidebar. I'm also a brand new follower. I am going to work on some throw pillows and quilts to match. Also, I followed your blog!! I plan to make a tree skirt and two table runners, and maybe a wall hanging/advent calendar. I have no idea what I am going to make this year! That's why your event is so great, it will get me thinking about it, and early! I'll be making placemats for our kids who live in far away countries and can't be home at Christmas... That's 4 plus 2 spouses. I hope to make something quilty for my holiday door. Christmas! YIKES!!! Guess never to early to start.